Sometimes our reviews point out what a blog lacks as much as what it contains. 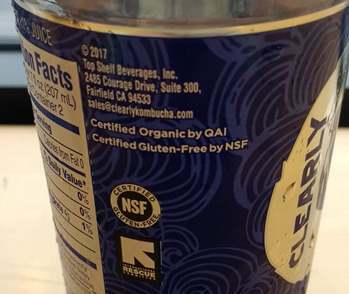 Our review of the Clearly Kombucha blog, and the company itself, is mostly about what’s left unsaid. H-P, Sun Microsystems, and Google are not the only successful start-ups to come out of Stanford University. Ali Zarrow and Caleb Cargle met at Stanford and started Clearly Kombucha, a Top Shelf Beverages brand. Eight years later they were acquired by MillerCoors: an incredible accomplishment in a short time. We couldn’t help noticing that news of the acquisition is strangely absent from both the Clearly Kombucha blog and their Press Release page. In June, MolsonCoors announced its first acquisition of a non-alcoholic brand when it picked up California-based Clearly Kombucha for an undisclosed fee via its TAP Ventures unit, which is charged with identifying investment opportunities outside of beer. Since acquiring Top Shelf, MilllerCoors has announced they are moving into cannabis-infused beverages. Will Clearly Kombucha follow GTs Dream Catcher with CBD infused ‘booch? One thing the parent company might want to review is the Clearly Kombucha blog. Graphics: Colorful images compliment the stories. Social Media: They have 3,681 followers on Twitter and have tweeted nearly 3,000 times since they joined in April 2012. Their 1,841 posts on Instagram have attracted nearly 30,000 followers. Their Facebook page over 17,000 followers. And because we value transparency, clearly, you won’t find any gunk or sketchy ingredients in our booch. In the absence of recent blog posts, we found information on the company from a number of other sources. This great video shows their production facility and has a catchy #EatSleepBoochRepeat theme. This 2015 video shines light on the founders story. The idea of taking a gamble on kombucha came to Caleb and Ali in Las Vegas. This ‘Boochin’ Boss Babe’ post appears to be a one-off profile, despite the claim that they planned to highlight a number of women leaders, they begin and end with Ali. Throughout March, we’re highlighting some of the most inspiring badass booches in our community. They’ll share with us their inspiration, the challenges they face as women in their industries, their female role models, and what makes them feel like #girlbosses. I often feel as though people don’t take me seriously. I’m on the shorter side, I look younger than I really am, and I’m a female CEO. I am consistently underestimated and doubted. And being a female in a predominately male industry doesn’t help either. But as I said before, “no’s” have gotten me where I am today and push me toward where I want to be tomorrow. One of my biggest role models is Beyoncé. How can you not be inspired by her?! She has so many talents and roles– performer, business mogul, and activist. And she’s giving birth to twins, how #badass is that?! A half-dozen of their blog postings are minimalist listings of favorite tunes. As is our tradition, we’re wearing our snazziest flair vests to work today and we want to share some of the fun with you! Head on over to our Instagram to enter our second Flair Friday giveaway! We’ve partnered with the rad folks at The Found, Valley Cruise Press, and Darling Distraction on this one. A company with a blog that’s not been updated for a year or more might be better off removing the link from the home page. Sometimes the kindest thing is to do is kill it. They also post iconic San Francisco pictures to their Instagram feed (the Golden Gate Bridge, Victorian houses, and more) but none of Fairfield. However, Fairfield is actually over 50 miles north-east of San Francisco. To people outside the Bay Area this might seem like a minor quibble. After all, San Francisco has worldwide name recognition, whereas Fairfield is the US equivalent of Neasden. From a marketing perspective a product with San Francisco associations is in the same league as Anchor Steam Beer, Ghirardelli Chocolate and Rice-a-Roni (“The San Francisco Treat”). Given the distance, it’s rather like a company in Brighton, England claiming they are in London when they are actually 50 miles away on the south coast. Did this company do something to you personally? You seem a little harsh on a start up that was acquired. Regarding the Fairfield vs San Francisco issue you clearly have, have you looked where all of their offices are? Could be why they post from the city! Nothing personal. We’re just trying to bring more transparency to the industry. They did great to build a successful company in such as short time (what is it, something in the water at Stanford?). Their offices are at 2485 Courage Dr, Suite 300, Fairfield (according to the label). Here’s an interesting interview at Expo-West 2019 with general manager Maria Del Rio. She discusses how the company approached its rebrand, how the brand is expanding distribution through Molson Coors, and why its parent company is branching beyond beer and into non-alcoholic categories. On revisiting the site I see their blog is part of brand refresh and has a completly different look than it did when the review was written. The graphics are cleaner, but the blog postings are not dated so it’s not “clear” how recent they are. There’s a bit of stray HTML code here and there (missing links, etc.) and “Ali’s Profile” mentioned in the January review seems to have been taken down. Our previous critique about the lack of clarity around the Coors acquisition is no longer valid, kinda. They do list the headline on the Press+More tab but the ‘View More’ button does not, at this time, go anywhere. Clearly, something to be looked in to.